Vision International College was founded in Tasmania (Australia) in 1974 by Dr. Ken Chant. Vision International College Australia (VIC) is accredited by the Australian Skills Quality Authority (ASQA). Students who complete studies with Vision International University USA may transfer to Vision International College Australia and, upon completion of additional coursework and payment of transfer fees, receive an accredited award that may be transferable to other accredited institutions. Students will remit a transfer fee to VIU on behalf of VIC. The transfer fee, covering both institutions, is a total of $300 USD per award. Additional course fees (typically 2-3 courses per award level at $250-350 AUD per course) are paid directly to VIC Australia. Students who successfully complete two years of study with Vision International University may transfer to Vision International College Australia's accredited Advanced Diploma of Christian Ministry and Theology. This award has been evaluated by Educational Credential Evaluation Services (ECE) and World Education Services (WES) as equivalent to an Associate's degree (60 semester hours) with regional accreditation in the United States. Students who successfully complete four years of study with Vision International University, or have been awarded a California State authorized Bachelor's degree from VIU, may transfer to Vision International College Australia's accredited Graduate Diploma of Christian Ministry and Theology. This award has been evaluated by Educational Credential Evaluation Services (ECE) and World Education Services (WES) as equivalent to an Bachelor's degree (120 semester hours) with regional accreditation in the United States. Download and complete the VIC Registration Form. This form has been pre-filled to include VIU as the student's "employer" to identify the student as transferring from VIU. Complete all required fields. VIU will complete the registration payment section on behalf of the student. Note that the transferring student will remit any additional study fees directly to VIC Australia. Be sure to indicate the award level for which you are pursuing transfer: either the Advanced Diploma (2 years) or the Graduate Diploma (4 years). Download and complete the VIU Transcript Request Form. Submit both completed forms via email to Maureen Kelley at mkelley@vision.edu. VIU will bill you directly for the transcript request, transfer processing fee, and VIC registration fees. VIU will submit your registration and transcript directly to VIC Australia. VIC Australia will contact you directly about the next steps to complete required subjects with VIC Australia, payment of additional study fees, and completion of the award. In addition to the $300 USD fee paid to VIU, you are required to pay a $75.00 AUD registration fee with VIC and pay for the cost of each additional course at VIC (called units). The cost of each unit is $375.00 (AUD) approx $265.00 USD, depending on exchange rate. Upon payment of all fees and completion of additional courses, you will be awarded the Graduate Diploma (Bachelor's equivalent) from Vision International College Australia. Upon completion of your accredited awards, you may pursue further studies by transferring to one of your accredited partner institutions or continuing advanced (unaccredited, state authorized) studies with Vision International University USA. 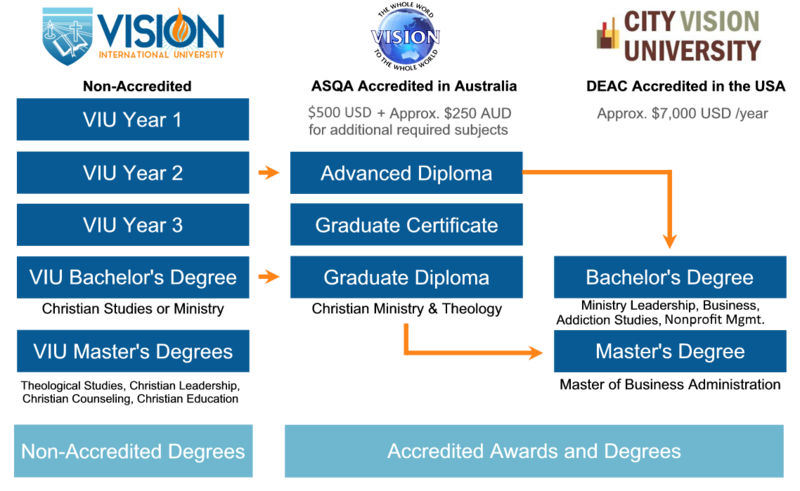 City Vision University is accredited by the Distance Education Accrediting Commission (DEAC), a US Department of Education (USDE) and Council for Higher Education Accreditation (CHEA) approved accreditor. For students who completed the accredited Advanced Diploma from Vision International College Australia, City Vision University offers accredited bachelor's degree completion programs in Business, Christian Ministry & Leadership, Addiction Studies, and Nonprofit Management. For students who completed the accredited Graduate Diploma from Vision International College Australia, City Vision University offers an accredited Master of Business Administration degree.